Pakistan no doubt has excellent talent, the only thing lacking is the organization and management of resources, human and natural alike to take into concern available opportunities. In search of talent we came across Zeeshan Ahmed. Zeeshan Ahmed, born 15 Jan 1983 in Gujrat Pakistan, a 29 Years old Doctoral Scientist and Software Engineer at the Department of Bioinformatics, Biocenter (an CHE-Excellence Rated European Research Institute), University of Wuerzburg Germany (among top rated science universities Worldwide). His main field of research is Computer Science (& related) and has more than 14 years of university education, more than 11 years of professional experience of providing services as individual and as team member with different multinational organizations with emphasis on software engineering of artificially intelligent systems and worked in more than 20 research and industrial projects. During his doctoral research, he has written several International Publications only as the First/Main author including 7 written and edited Books, 2 Book chapters, 23 Journal manuscripts, 36 International Conference full papers, 2 Workshop papers, 9 Project reports, 5 Scientific magazine/newsletter articles, 18 Poster papers, 4 Thesis (supervised), 24 Seminar papers & presentations and more than 22 Edited Journal issues including 2 Full Volumes as Editor-in-Chief. In total he has published more than 100 publications during doctoral research and still with the will of God; he is continuing his research and development. Achieving this land mark in research during doctoral research is not less than an excellent achievement. Complimenting his these efforts, he has been offered to be the Referee for more than 15 International Journal Publishers, Technical Program Committee member for more than 35 International Conferences (including IEEE, ACM, Springer etc.) and chosen for research presentations at Microsoft, MIT, INITs, CEBIT and European Commission. So, far his research has been published and presented in more than 25 countries of the World. we tried to explore the extra-ordinary genius, the driving forces that lead him through his most challenging times of his life and achieve what seemed impossible, the countless achievements throughout his studies and career. Lets hear what Zeeshan Ahmed has to say! School: I did my nursery education from Standard high school, primary education from Sidra model high school and at the same time I was also enrolled and did exams in Islamia high school Kunjah as well. I did my Middle education from Shaukat model high school and Matric with science subject from Grammar high school. 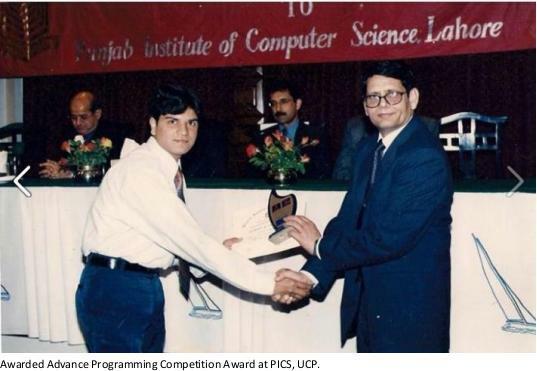 (1986-1988) College: I did my intermediate education with Computer Science subjects from Government Zamindar Degree College Gujrat. Along with my 2 years higher secondary education, I did some short courses and one year Diploma in Computer Applications from Imperial College of Computer Science (ICCS) Gujrat. (1998-2000). I started my university education with 4 years Bachelor of Science in Computer Science (BS. CS) and Master of Science – Computer Science (MS. CS) with major Software Engineering subjects from University of Central Punjab, Lahore Pakistan; Faculty of Information Technology, Punjab Institute of Computer Science (PICS). (2000-2005) Later then, I did my 2nd Master of Science – Computer Science (MS. CS) with major subjects of Intelligent Software Systems from University of Blekinge, Ronneby Sweden; Faculty of Computer Science, Department of Artificial Intelligence, Blekinge Institute of Technology. Due to the good results in course work completion, I was selected and did Master Research Thesis at Fraunhofer Institute for Experimental Software Engineering (IESE), Kaiserslautern Germany. (2005-2007) I started my PhD education and completed doctoral course work from Vienna University of Technology, Austria; Institute of Engineering Design and Logistics Engineering. Later then further continuing my doctoral studies, I got enrolled myself at University of Wuerzburg Germany; Department of Bioinformatics, Institute Biocenter. Now, I am looking forward to continue my studies as post doctoral researcher. (2007-2012) My one of the heartiest wishes is to keep getting education till the end of my life. Were you a ‘parhaku’/nerd when you were a student? Like a board topper or something? No, I was an average student during my school education. Who doesn’t like to be a top position holder? My problem was the applied education system of that time, because I was a kind of children who likes to learn but cannot remember lessons word by word ( so called “ratta”), which was the primary demand of the most of my school teachers, especially in solving exams. How did you become interested in the field of computer science? I feel like, it is in my blood. My first childhood association to this field was the love towards video games. When I was a child, I always loved playing and dreamed of creating games. So to me, that time it was the best approach fulfilling my desires. Why do you love Computer science? What’s so special about it? Who was your inspiration and what inspires you to presume this field? Truly speaking, I was not inspired by anyone. It was the sound of my heart to go with this field. Serve the field of Computer Science for the betterment of humanity. Best Young Researcher by IEEE , PNCE , NUST and HEC. 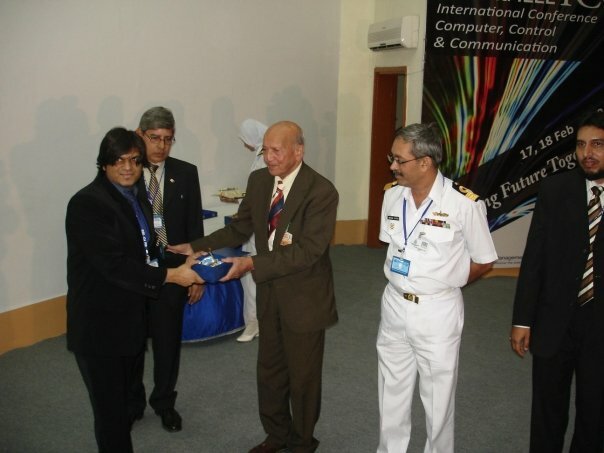 — with Head of Engineering Department PNEC, IEEE Chief and Pak PNEC Cheif in Karachi, Pakistan. Pakistan is already standing high but unfortunately without any shadow because all the lights are at others. My immediate plan was to first develop myself by getting good education and becoming a good professional because I believe, “those who can’t help themselves, how can they push country to grow”.Next, being a Pakistani, I want to keep contribute in highlighting the name of country in the World with good reputation. What troubles did you have while doing your research projects? Two troubles I have faced so far i.e. inside Pakistan and outside Pakistan. 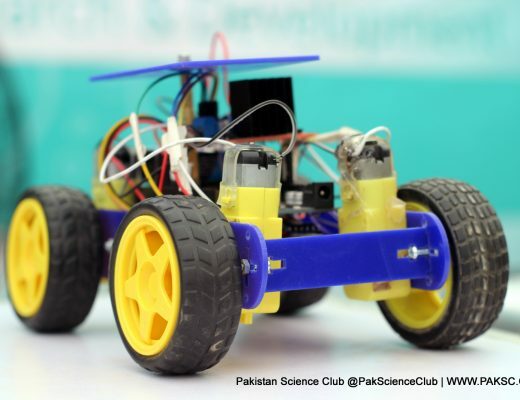 Inside Pakistan; it is quite difficult to continue the research in the field of Computer Science because in most of universities the most of the encouragement is towards lectureship, research project funding is not available, job insecurity rate is high, lack of provision of internships to undergraduate students etc. Furthermore one of the strange reasons is the sitting monopoly of only natural science’s related people among higher education governing bodies which always enforce their (natural science’s related) standards to Computer Science as well which is quite wrong. Outside Pakistan; these are more diplomatic reasons. It completely depends on the people you are working with. Most of the times you have to compromise your research related wishes because otherwise you might will lose your job with living status and have to quit everything in between. In such case unfortunately even most of the universities in Pakistan will not welcome you, which is quite embarrassing. Who were your guides for your projects and research works? Prof. Thomas Dandekar; University of Wuerzburg Germany. Prof. Wolfgang Eisenreich; Technische University of Munich Germany. Prof. Detlef Gerhard; Vienna University of Technology Austria. Prof. Rune Gustavsson; Blekinge Institute of Technology Sweden. Adam Trendowicz; Fraunhofer IESE Germany. Taqdees Siddiqi; University of the Punjab, Pakistan. 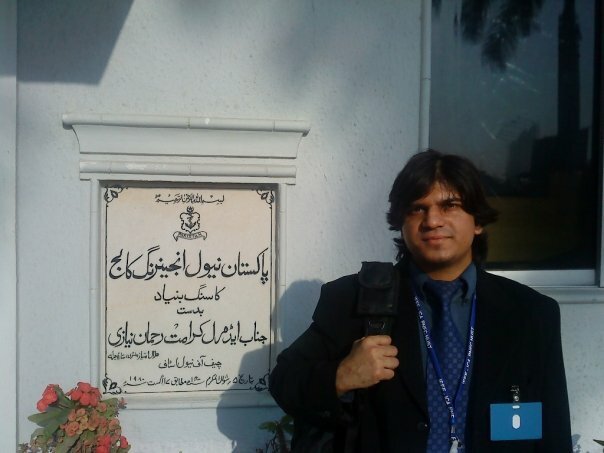 Sarfraz Bukhari; University of Central Punjab, Pakistan. How do you think that the government and universities should help people like you? They should motivate and encourage by offering at least long time minimum possible research facilities to continue their research and development work. Did your family, friends or teachers helped in your research? Yes, I got moral encouragement from my family, friends and teachers. 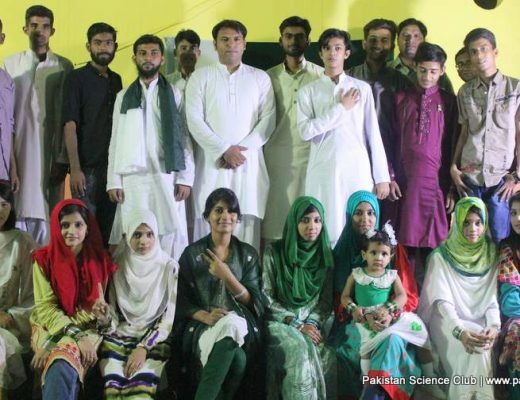 Is there a lack of scientific talent among Pakistani youth? There is no such lack of scientific talent among Pakistani youth but right approaches to be followed. How important is the brain drain factor? You can only develop a country with the skills and talent of your own countrymen because no one will love your country like your own nationals. Yes; here I would to share two very important facts of my life which could be little inspiring and motivational for youth. For last more than 10 years I am continuously doing professional jobs along with my studies to afford the expenses because my mother advised me to not to go for loan, funding or scholarship but ask help only from Allah (God) and try to earn with your hands to pay your education and living expenses. Doing this might you will get hard time but in return you will get the quality education with respect, confidence, honor, internal satisfaction and as a proud person. “Try living your life doing something valuable rather than demanding things”. In 2005, when I went Sweden for my 2nd Masters, you will be surprised to hear that I had only around 1000 Euros to live with, which I have earned. When I reached there, I found it’s hardly possible to live for even some months with that amount. Then I thought that I had two options to follow; one is to do odd jobs and support education like many other foreign students, which ultimately prolongs their degree timeline and sometimes even finishes their careers. The second option was to finish whole master’s course work in only 4 months which was quit impossible to do, as nobody did that before. Believing Allah and following my heart, I took the challenge, walked everyday more than 5 kilometers to reach university saving bus ticket money, reduced eating, lost more than 10 kg weight in some weeks, took all master’s courses in one semester, and with the help of Allah and by working hard around 16 to 18 hours a day, I did my whole master’s course work in only one semester. Later then immediately I was offered Master’s thesis and professional job in Fraunhofer IESE Germany. I mentioned this, because I want to give a message to the youth that sometimes we get hard situations in life. “Please do not give up your goals, try hard, everything is possible”. I have one message to the government and universities of Pakistan that please respect, love and support your talent whether that is inside or outside country.